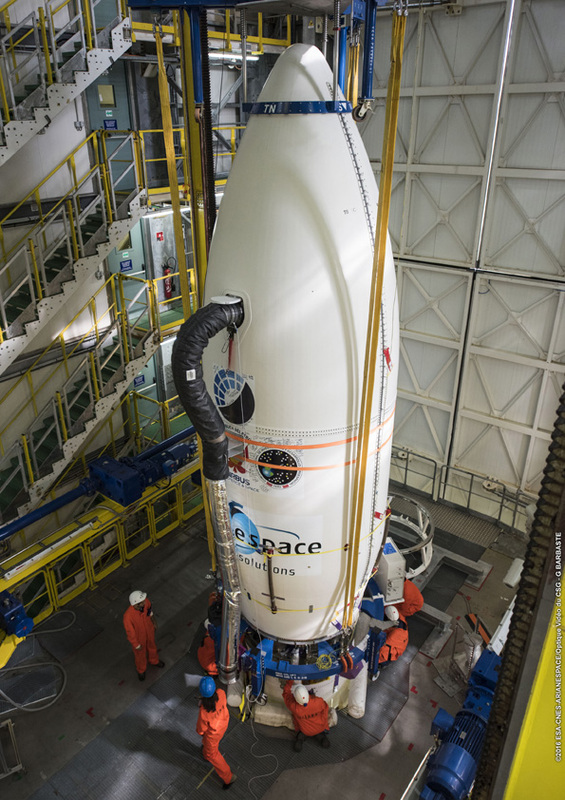 Five Earth-imaging spacecraft for the Peruvian government and Google’s Terra Bella satellite subsidiary are enclosed inside the nose cone of a Vega rocket for liftoff Thursday from French Guiana. 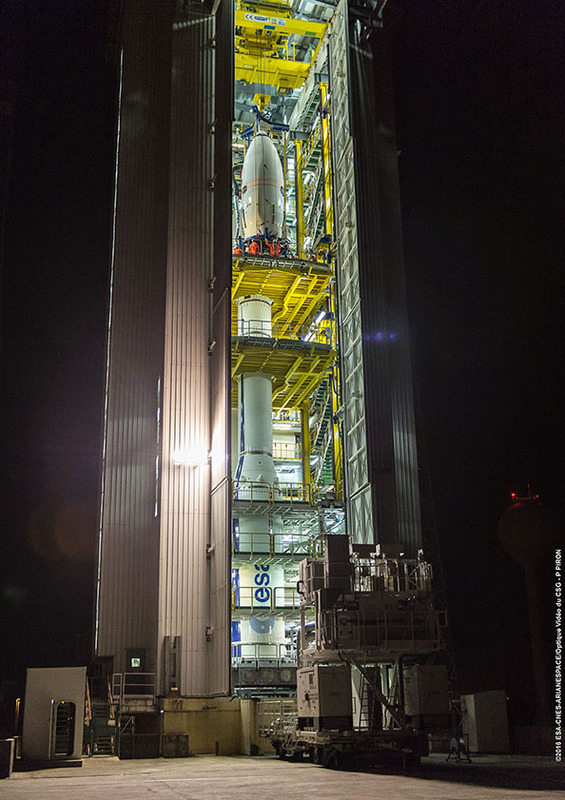 The French-built PeruSat 1 satellite and four commercial surveillance satellites made in Silicon Valley will blast off aboard the four-stage Vega rocket at 0143:35 GMT Friday (9:43:35 p.m. EDT Thursday) from the Guiana Space Center on the northeastern coastline of South America. 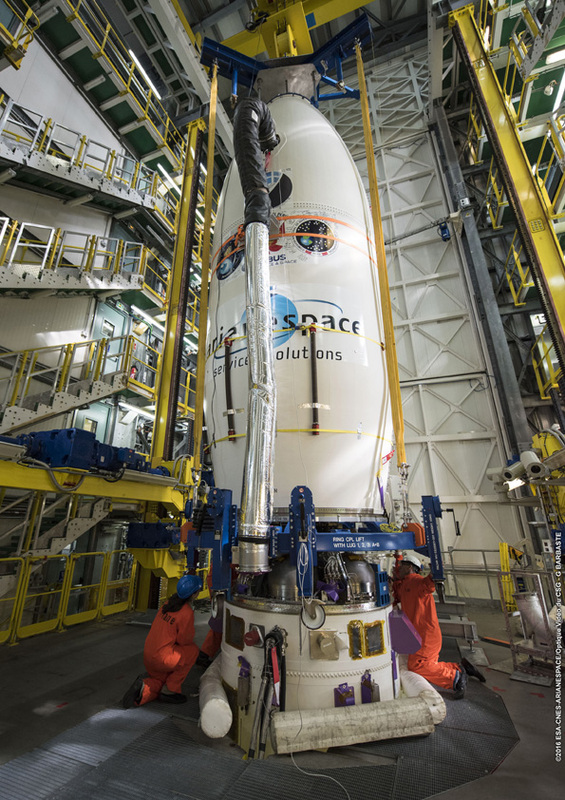 It will mark the seventh launch for the European-funded, Italian-led Vega rocket program, and the first Vega launch of the year. 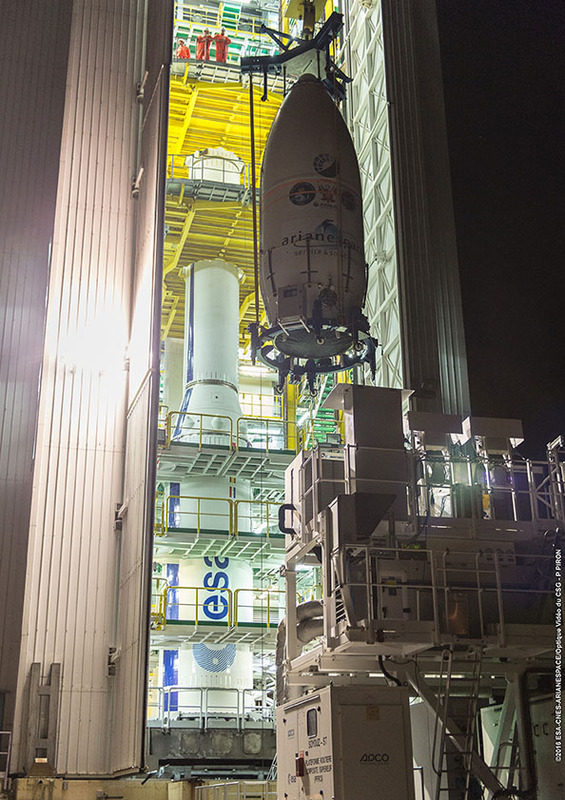 Soaring north from French Guiana, the Vega rocket’s three lower solid-fueled motors will ignite in succession to drive the launcher into space — but just shy of orbital velocity — in the first seven minutes of the mission. 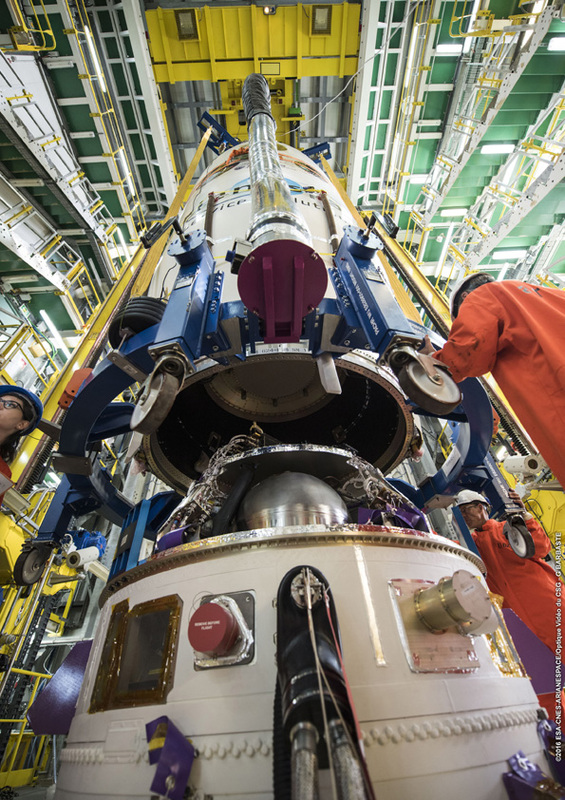 The launcher’s Ukrainian-made RD-843 fourth stage engine will fire five times to inject PeruSat 1 and the four Terra Bella satellites into two different orbits, then steer the spent upper stage onto a disposal trajectory. 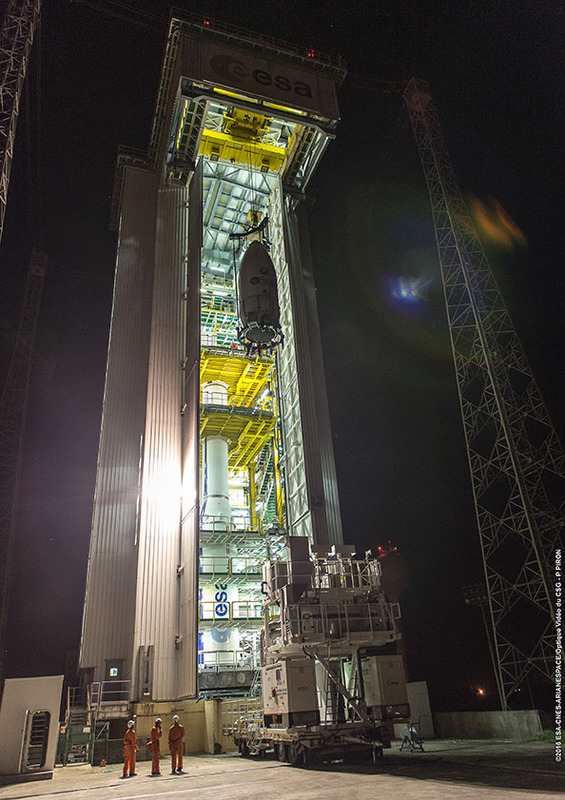 Separation of the Terra Bella satellites will come first, approximately 40 minutes after blastoff, according to a timeline released by Arianespace, the Vega rocket’s commercial operator. PeruSat 1’s deployment will come at T+plus 1 hour, 43 minutes. 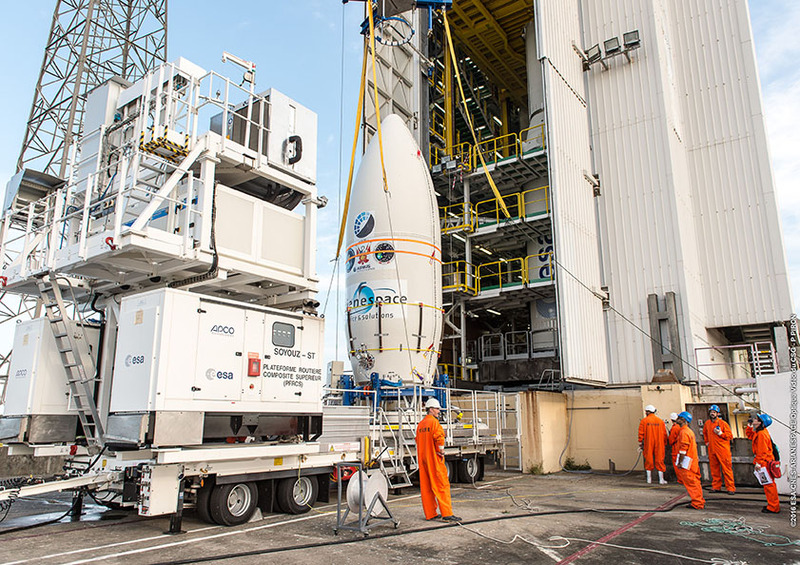 Built by Airbus Defense and Space in Toulouse, France, PeruSat 1 weighs nearly 950 pounds (430 kilograms) and will collect high-resolution imagery for the Peruvian government. 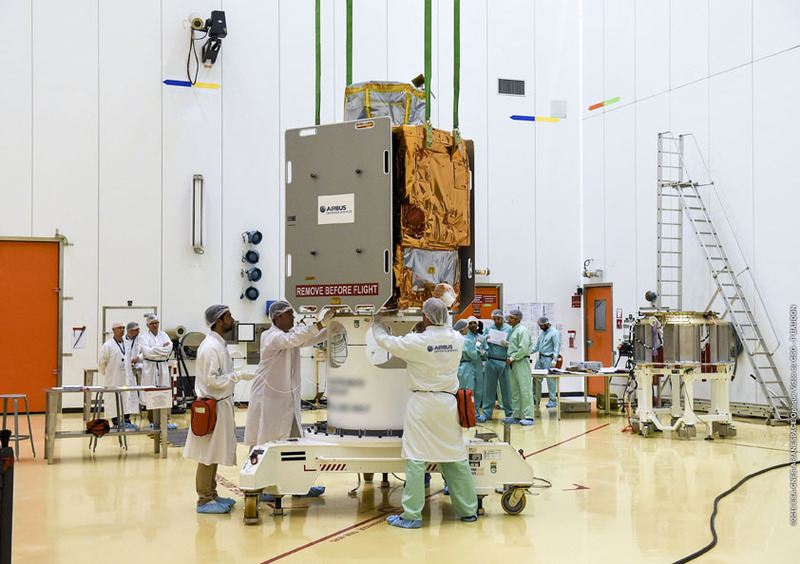 Airbus will turn over control of PeruSat 1 to Peruvian engineers by the end of the year, once testing of the new satellite is complete. 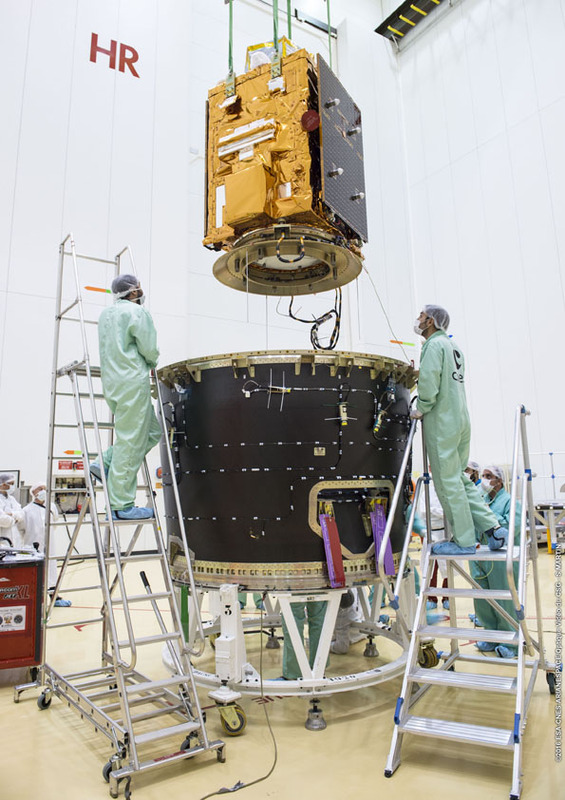 Airbus originally signed the PeruSat 1 contract with the Peruvian Defense Ministry, but Peru’s national space agency — CONIDA — is now listed as the official customer. 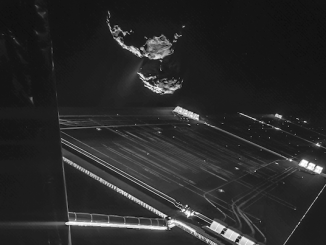 PeruSat 1’s optical camera will resolve objects as small as 2.3 feet (70 centimeters) across from its perch 431 miles (695 kilometers) above Earth. The quartet of Terra Bella satellites — dubbed SkySats — each weigh about 240 pounds (110 kilograms) and were manufactured by Space Systems/Loral in California. Owned by Google and based in Mountain View, California, Terra Bella was formerly known as Skybox Imaging until a rebranding earlier this year. Terra Bella has three satellites already in orbit collecting still images with resolution better than 3 feet, or about 90 centimeters. 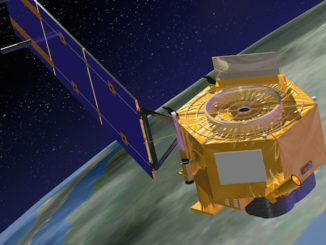 That does not compare to the high-resolution capabilities offered by government-owned spy satellites or large government-backed orbiting reconnaissance platforms, but Terra Bella says it separates itself from competitors with unique capabilities and low prices enabled by the company’s compact satellite design. 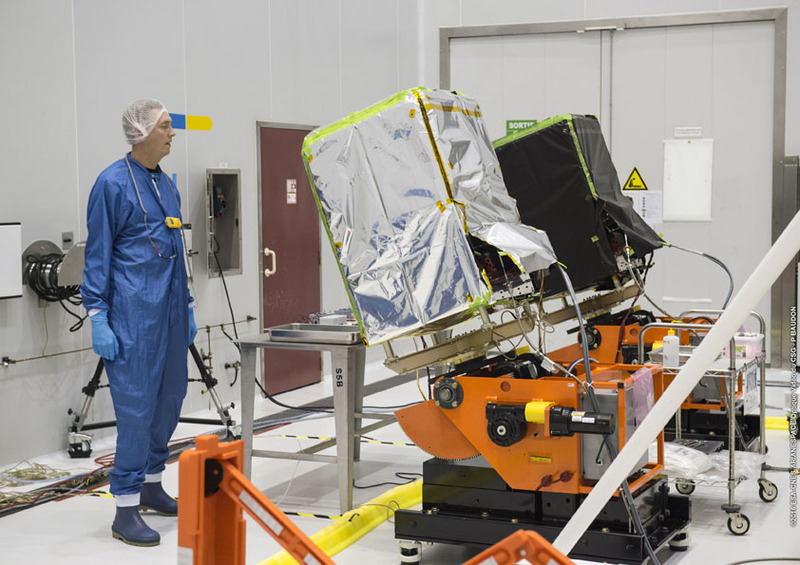 Each SkySat spacecraft’s camera can capture multiple frames per second, allowing image processors on the ground to stitch together the photos to create the first commercial high-resolution videos of Earth from a satellite. 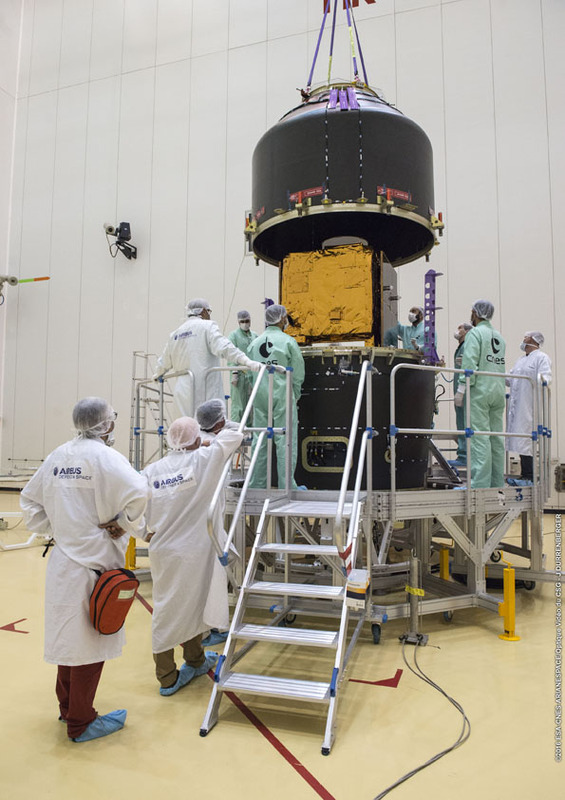 The SkySats are about the size of a dorm room refrigerator and carry a Swedish-developed propulsion system fueled by environmentally-friendly “green” propellant. 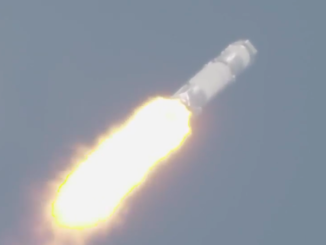 The thruster package burns an ammonium dinitramide (ADN) based liquid propellant, replacing the toxic hydrazine more commonly flown on satellites. 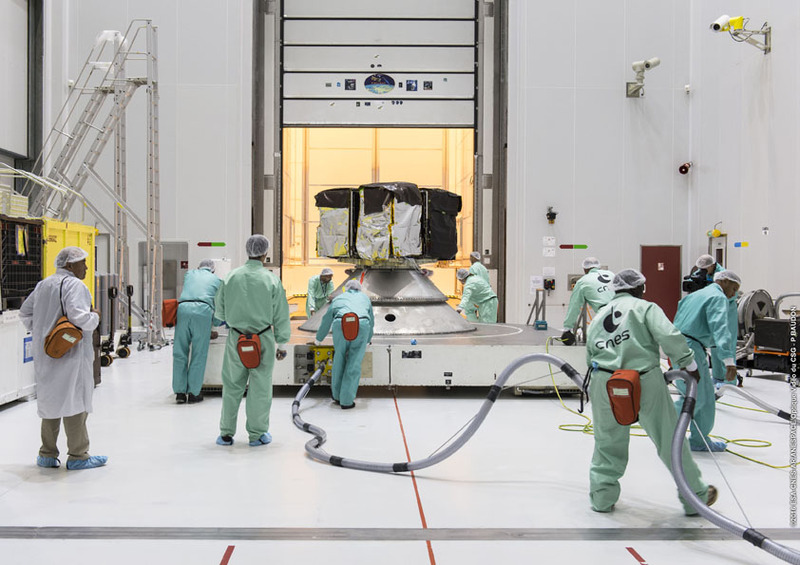 For example, technicians did not have to wear hazmat suits during fueling of the SkySats with their stable green propellant, as they do when handling toxic hydrazine. Terra Bella and Space Systems/Loral are building more satellites, with six additional Earth-viewing craft scheduled for launch in early 2017 aboard an Orbital ATK Minotaur-C rocket from Vandenberg Air Force Base, California. The last Terra Bella satellite — SkySat 3 — launched on a rideshare mission on an Indian PSLV rocket in June. 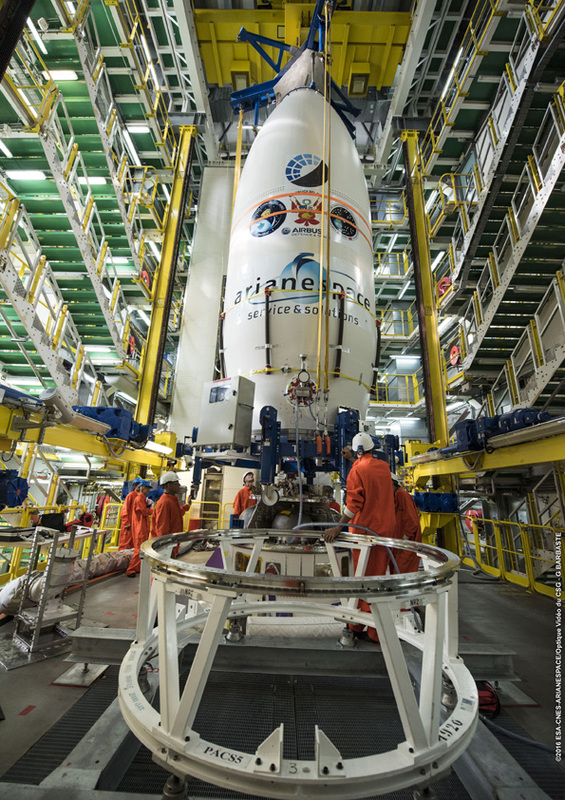 Terra Bella has not disclosed launch arrangements for another eight satellites it has ordered from Space Systems/Loral. 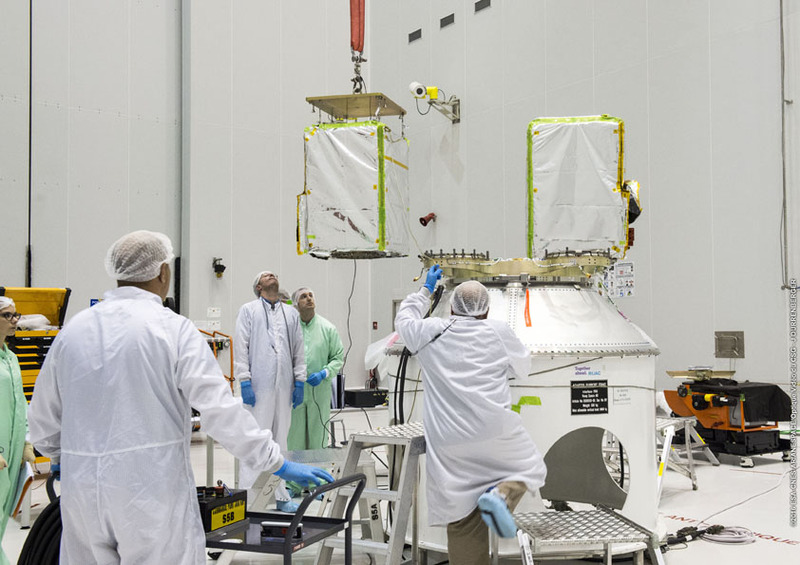 See below for more photos of the PeruSat 1 and SkySat satellites during launch preparations, when PeruSat 1 was closed inside the Vega rocket’s Vespa dual-payload adapter structure. 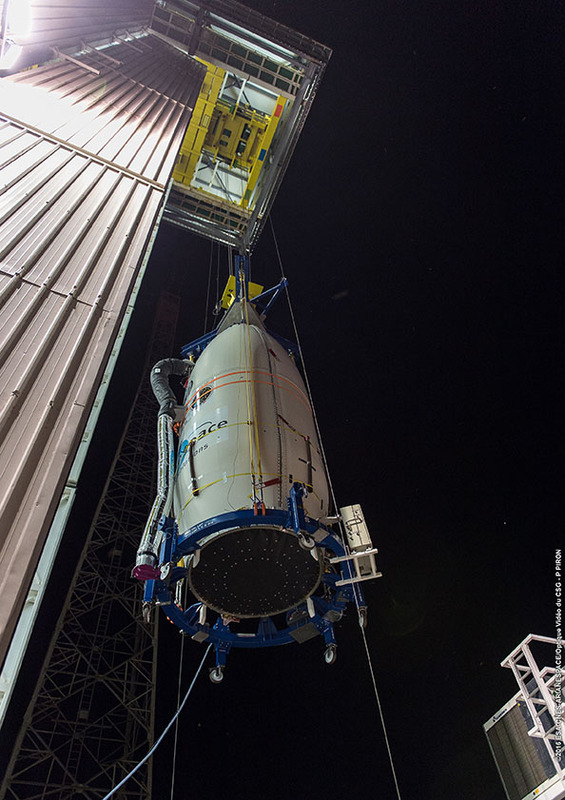 There are also additional images of the Vega rocket receiving its payload fairing containing the spacecraft.